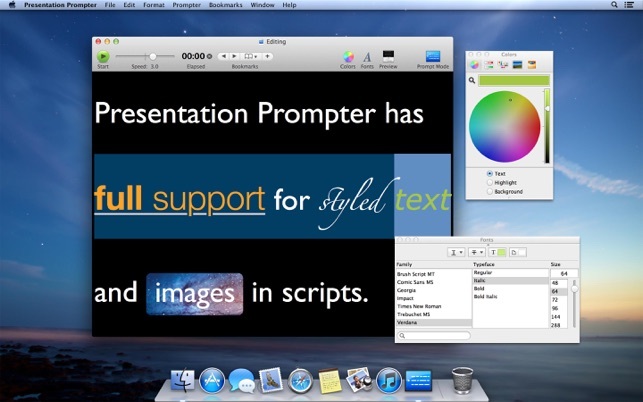 Presentation Prompter turns your Mac into a teleprompter and helps you deliver successful presentations. It is built for live performers, newscasters, actors, public speakers, narrators, and anyone who has ever used cue cards or read from a script. Write or import scripts, then scroll them smoothly on one or more screens. – Smooth scrolling, GPU–accelerated and tuned for particular hardware. – Precision speed controls let you accommodate any speaking rate or text size. – Dual–screen prompting displays your script on a second screen. Optionally flip the script only on the other screen if you’re using a mirror enclosure. – Teleprompter operators can see exactly what the talent sees on their own screen, resulting in better communication between the operator and talent. – Minimize talent eye movement with one–click margins. – Maintain your reading position with an adjustable focus arrow. – Never run over your allotted time! Show a clock and remaining time estimate below your script for time–awareness. – Prevents accidental edits, screen saver activation, and other interferences while prompting. 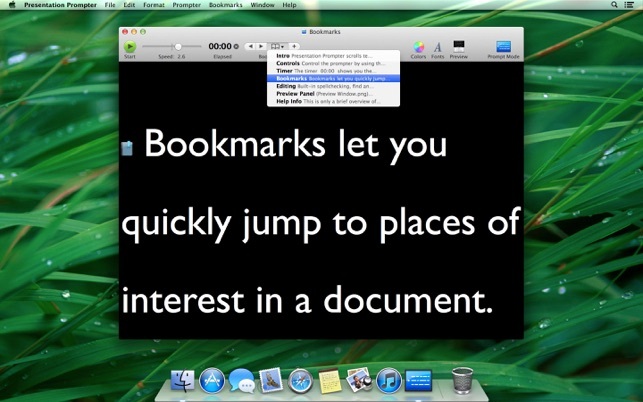 – Mark sections of interest and jump to them instantly with bookmarks. Great for rehearsing a difficult part or managing any large script. – Control the prompter using your keyboard and trackpad, or use a dedicated remote or controller. – Write and modify scripts in a dedicated editing environment — there’s no need to use a separate app. 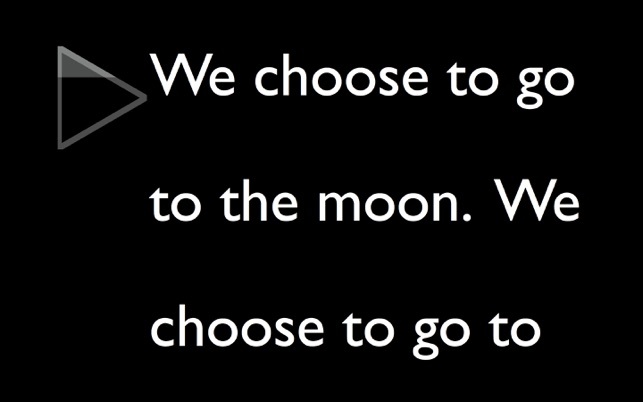 – Highlight speaker names, use a special style for difficult–to–pronounce words, and space lines perfectly to make them easier to read. Use any combination of fonts, colors, and spacing for readability and emphasis. – Compatible with MS Word and other common file formats to quickly get existing content into Presentation Prompter. – Print scripts for backup or rehearsal purposes. Ink saver features improve readability and print time. – Adds required support for macOS 10.14 “Mojave”. – Reworks the Preview window to be faster and use less memory. – Making edits when using a second display is faster and smoother. – Making changes to your document can now track in the Preview window in single-screen use. – Makes the “Bigger” and “Smaller” font size menu items increase and decrease 10 points at a time. – Adds page numbers to printed documents. – Adds support to the timer toolbar to display elapsed hours. – Fixes issues when inverting black and white colors. I would put Presentation Prompter up against some professional teleprompting software programs (with attendant scroll hardware and setup). Easy to use, works perfectly, and allows for amateur on-the-fly prompting. Positives: Bookmark capabilities, spellcheck (etc. ), smooth running and easy control, easy to use, can import word and text files, etc. Negatives: Wish that it had stored formatting by speaker (but that’s a very advanced, little-used feature). Wish it had a built-in, on-prompter speaker timer that counted down instead of up. These two things are very minor, however. Can be used in a professional, large-event setting with professonal keynote speakers who are used to all kinds of teleprompting setups. 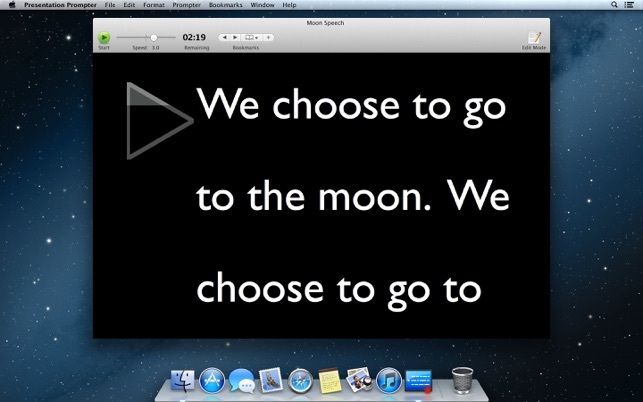 We've bought most of the teleprompter software available for the Mac. This is the most flexible and most stable that we've seen to date.